The Power Chopper from Global Shop Direct is a single food preparation device that can help you prepare fresh meals in seconds. 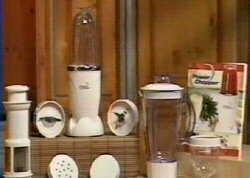 It’s a food processor, a big sized blender, a powerful chopper and lots more. It is so compact it won’t take up valuable kitchen space and it replaces a cabinet full of bulky machines. The Power Chopper blades are made to the highest standards of German Stainless steel. They are dishwasher safe so clean up is a breeze. The complete Power Chopper system comes with the power base, the chopping blade, the blending whipping blade, the large container and the big blender. Order now and we’ll also include our amazing juice extractor, a shaker lid and a storage lid, personal sized container with sipping ring plus the Power Chopper recipe guide and a 12-month warranty on the blades. The Power Chopper system will be delivered directly to your door for only 3 monthly payments of $49.95 plus $29.95 postage and handling. Test drive one in your own home for 30-days and if you don’t fall in love with it, simply return it for a full refund of the purchase price less postage and handling.